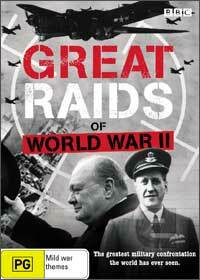 Great Raids of World War II is a first class documentary series about the greatest raids during one of man's darkest hours. The series accurately recreates these raids with eye witness reports from veterans and professionals alike that are matched with realistic 3D computer generated graphics to help give the viewer an accurate portrayal of how dangerous, daring and amazing some of these raids were. Containing all six episodes from this ABC series, Great Raids of World War II feature stories such as a group of paratroopers capturing one of Hitler's key German radar installations at Bruneval which allowed British bomber pilots strike at the center of Nazi Germany that is quite simply riveting. Definitely one for the World War II documentary buffs! The video and audio quality of this series is rather standard and will not win any accolades, however the use of computer generated graphics really assists the viewer with a unique and first-person perspective of these amazing World War II raids. With over 139 minutes, Great Raids of World War II is a much have for those that cannot get enough of WWII documentaries or for those lovers of documentaries.